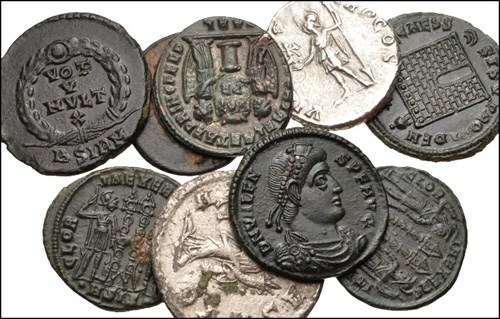 Roman coins are readily available and can be acquired for reasonable prices. Like so many areas of numismatics, ancient coins offer opportunities for collectors of most every budget – ranging from less than $10 per coin to astonishing masterpieces that fetch seven figures. This time, we’ll take a look at the budget end of the field: coins generally available for less than $100 each. A surprising number of ancient coins, all readily identifiable and of historical interest, can be acquired for less than $100 – and often in the $5-to-$25 range. This is especially true with Roman coins, which are the focus of this column. Group lots offered at auction are one of the best ways to acquire ancient coins at a low average price. Below are three examples from recent online auctions. Shown above is an excellent mix of 14 Late Roman coins from a variety of imperial mints (and the provincial mint at Alexandria, Egypt). It sold for about $225, breaking down to about $16 per coin. The 20 Roman silver denarii and double-denarii shown above realized about $770, which breaks down to an average of $38 apiece. Included are coins with attractive portraits of the famous emperors Trajan, Marcus Aurelius and Commodus, as well as others less well-known. The interesting mix of nine Late Roman coins shown above sold for about $260, breaking down to less than $30 per coin. 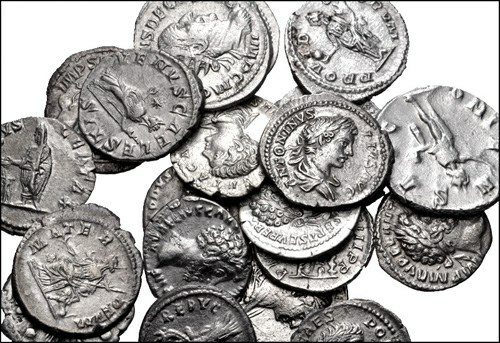 Many numismatists are surprised to learn that attractive silver coins of the 2nd and 3rd Centuries A.D., such as those pictured in the groups above, can be acquired at such reasonable prices. Yet coins like these are readily available and easily acquired. Not only is there a good variety of issuers, but when you’ve gotten one of each, hunting down the literally thousands of different reverses is enough to challenge any collector for a lifetime. Roman silver denarii minted under the Roman Republic also can be inexpensive when not in exceptional condition. A wide variety of denarii were struck under the Republic from about 212 B.C. to the 40s and 30s B.C. Below are five examples recently sold at auction which most collectors would find affordable. Struck in 111 or 110 B.C., this denarius of the moneyers Appius Claudius Pulcher, T. Manlius Mancius, and Q. Urbinius shows the helmeted head of Roma and Victory driving a three-horse chariot (triga). It sold for less than $85. 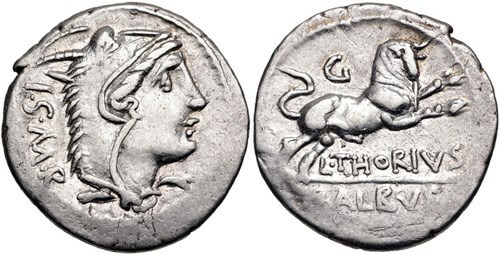 A few years later, in c.105 B.C., the moneyer L. Thorius Balbus issued the denarius above, which bears the head of Juno Sospita and a charging bull. It also sold for less than $85. 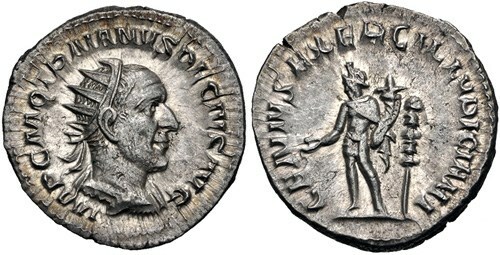 The moneyer C. Licinius L.f. Macer, in c.84 B.C., struck the denarius above showing the bust of Vejovis, who hurls a thunderbolt, and the goddess Minerva, who guides a four-horse chariot (quadriga). It realized about $90. The denarius above, with its as-issued serrated edge, was struck for the moneyer Q. Antonius Balbus in c.83 or 82 B.C. It shows the head of Jupiter and Victory driving quadriga. This attractive coin realized about $100. The ‘youngest’ of the five Republican denarii here is this piece issued by the moneyer L. Marcius Philippus in c.57 B.C. It shows the head of Rome’s fourth king, Ancus Marcius, and an equestrian statue upon an aqueduct. It fetched about $95. 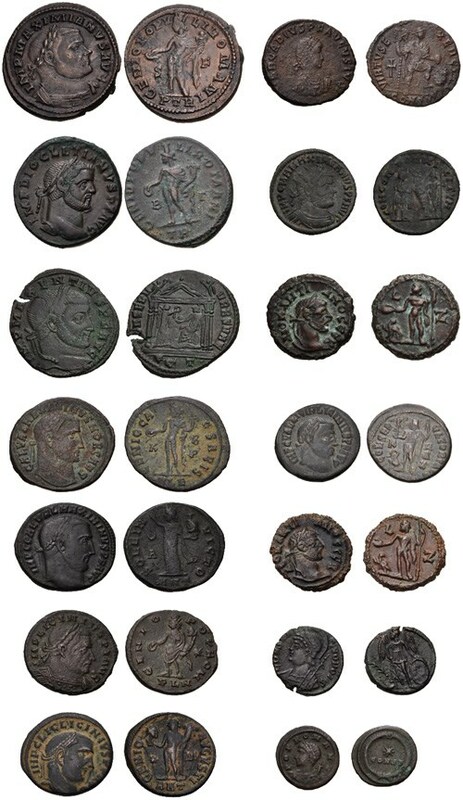 As we move from the Republic to the Empire, we find that Late Roman coins of the 3rd to 5th Centuries A.D. often can be acquired in very high grade at modest prices when they are of the more common varieties. Below are five examples from the 3rd Century. This silver double-denarius of the empress Otacilia Severa (A.D. 244-249), shown above, features her bust and the seated figure of Concordia. In excellent condition, it sold for less than $80. The emperor Trajan Decius (A.D. 249-251) is depicted along with the Genius of the armies of Illyricum on the silver double-denarius above, which realized about $70. Like other coins shown here, this billon double-denarius of the emperor Gallienus (A.D. 253-268), bearing his portrait and a walking panther, spent almost no time in circulation before it was buried. Even in such high grade, the piece above sold for less than $80. 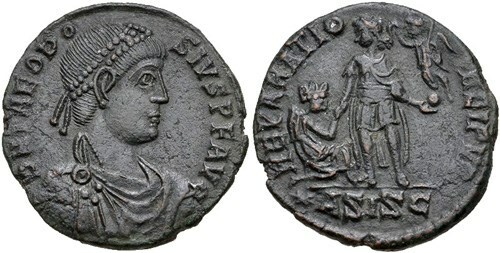 One of Gallienus’ successors, Claudius II ‘Gothicus’ (A.D. 268-270), issued the billon double-denarius above, which bears his portrait and the figure of Fortuna. Also in high grade, it sold for about $55. This billon aurelianianus of Probus (A.D. 276-282) with his bust and a scene of a female presenting the emperor with a wreath is high grade and still retains most of the silver coating it had when it left the mint. It sold for about $70. Equally affordable are Late Roman bronzes of the 4th and 5th Centuries A.D. In this context, ‘bronzes’ is a catch-all term for coins with copper as their principal metal (which includes various alloys of copper and ‘billon’ coins, which contain a small percentage of silver). Below are five LRBC’s (Late Roman bronze coins) that would tempt any collector interested in historical, high-grade coins for a reasonable sum. 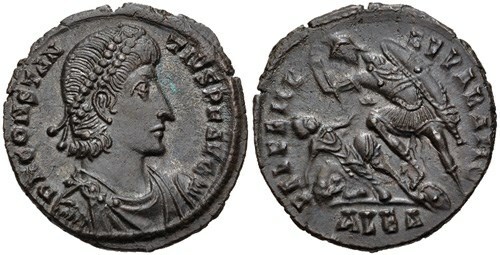 Rome’s first Christian emperor, Constantine I (A.D. 307-337), is portrayed on the billon AE3 of the Trier mint shown above. It shows on its reverse a votive altar surmounted by a globe, and sold for less than $80. 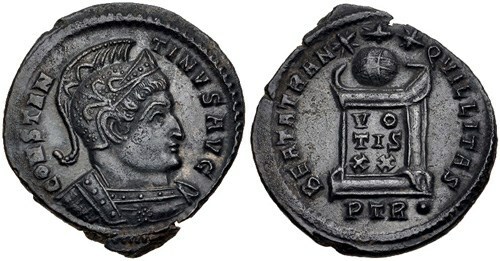 The billon centenionalis (above) of the Alexandria mint portrays Constantius II (A.D. 337-361), the longest-surviving son of Constantine I. Its reverse depicts a soldier spearing a fallen barbarian horseman. It sold for less than $60. The military bust of Julian II (A.D. 360-363) appears on the AE3 above. It was issued at the Sirmium mint, and its reverse shows a votive inscription within a laurel wreath. This historical coin of an emperor who tried to restore paganism in an era when Christianity had become the dominant state religion sold for about $70. The legacy of the emperor Valens (A.D. 364-378) was sealed when he led his army into a fatal Gothic ambush in 378. He is portrayed on an AE3 (above) from the Thessalonica mint, which bears a triumphant scene of Valens dragging a barbarian captive. It sold for about $55. We end the survey with a coin of another famous Late Roman emperor, Theodosius I (A.D. 379-395), who is portrayed on this AE2 of the Siscia mint. It bears the emperor’s portrait and a scene of Theodosius being crowned by Victory as he raises the kneeling figure of a turreted female. It sold for about $95.